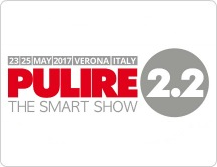 Corazzi Fibre will take part to PULIRE Fair from May 23rd to May 25th, 2017 at Verona Fiere in Verona, Italy. We will be glad to welcome you at our Booth G4/3 (Hall 4), where our complete range of professional cleaning products will be displayed. You can register online until May 25th, 2017.